One of the most important things I find I need as an artist is to regularly ‘feed’ my imagination and visual vocabulary, and one of the best ways to do this is by visiting the areas of the country that have an influence on the current and potential work I am producing. During 2018 I was fortunate enough to do this, having two visits to the Outer Hebride. Based at Taigh Chearsabhagh in Lochmaddy, I spent the weeks visiting my favourite sites on North Uist, and travelling to the neighbouring islands of South Uist and Benbecula, and to the Isle of Skye. The Scottish islands can not fail to inspire an artist’s creativity, with endless layers of stunning landscapes, history and fascinating wildlife. This is where you realise that on such a short visit you can only scratch the surface. My sketchbooks are filled with notes, sketches and ideas for potential new works, and collecting references and images for work in progress, such as the ‘Birdfall’ collaboration with my dear friend Donald S Murray. A perfect example of this was on several visits I made in June to the RSPB nature reserve at Balranald, on the west coast of North Uist. The Uists are an excellent venue in the between the spring and summer months to watch the migration of bird species heading to their breeding grounds in the Arctic regions. The beach at Traigh Iar that day was teeming with migrant wader species feeding and refuelling on their epic journey north, with hundreds of Turnstones and Sanderlings in their striking summer plumages, darting to and fro timing their runs against the breaking of the waves. having the opportunity to see these wonderful birds and observing their behaviour and moments helps me to depict them more naturally in the images I am creating, the beautiful details of the bright summer plumages and the way the birds dance and move on the sands. This working knowledge and insight is invaluable to me as an artist in making my work and trying to share the experience of seeing these birds with the visitors to the exhibitions or readers of the books. Looking towards South Uist from the St Kilda Viewpoint. From the viewpoint on Cleitreabhal a Deas, I could see across Sound of Monach to the Islands of St. Kilda, the remote Atlantic islands that have had a major role to play in my recent working life, allowing me to pay my own respects to Hirta, Boreray, and the long departed people and natural beauty of these wonderful islands which have fuelled so many ideas and images over the last ten years. And the trips too gave me a chance to visit new areas and explore more aspects of these wonderful Hebridean islands. November’s visit allowed me the opportunity for my first proper visit to South Uist (I’d passed through briefly in the past) and again a wealth of ideas and images flooded in to my imagination and sketchbooks. 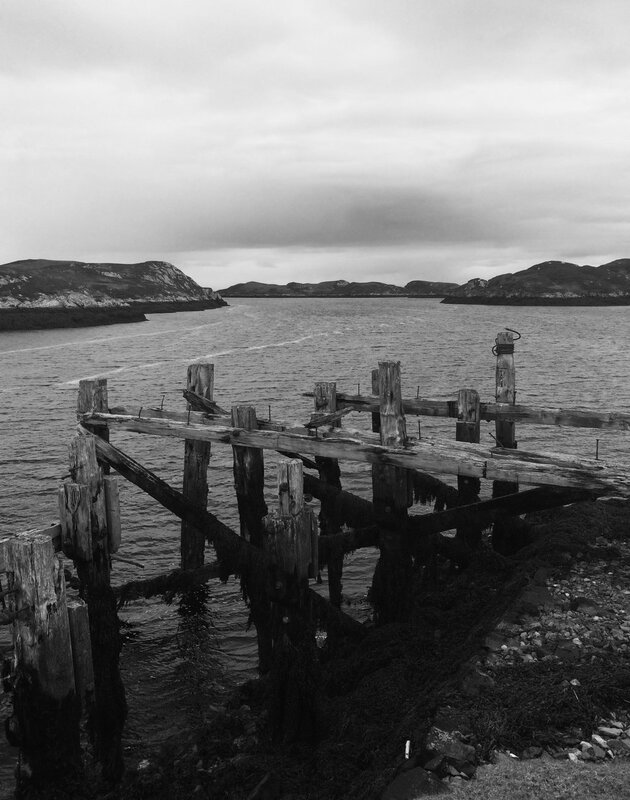 One trip with Donald to the remote old steamer pier at Loch Sgioport was breathtaking, with the stunning landscape and sea views enhanced by being accompanied on our journey by close fly-bys of Hen Harriers and Merlins, making this even more evocative and inspiring. I’m currently back in my studio in Hampshire, working with the notes and stories collected in the sketchbooks, and dreaming of my next trip to the Hebrides. Not too long I hope! This page promotes the work of Scottish Artist Douglas Robertson, and will include updates on his blog pages, and forthcoming exhibitions and events.